The DuraShield is the most advanced, high level manhole security device available. Even the most aggressive attacks will be deterred by what many have referred to as a “bank vault door” of protection. Secure your manholes from terrorists, thieves, saboteurs, vandals and protect your system with one strong manhole security device. Access is eliminated, safety is assured and your assets remain locked and protected with the DuraShield manhole security device. Other manhole security inserts use only two security points. The DuraShield manhole security device has three, reinforced security points to provide you with unmatched protection. That’s 50% more manhole security than other products. Using the McGard Multi-Purpose Tool with your registered key, you can install or remove the DuraShield manhole security device in seconds without ever having to bend over, strain or get on your hands and knees. Unlike other products on the market, the DuraShield manhole security device has no chains, bars or any cumbersome dangling components to hit your shins, ankles or any other part of your body. Watch our video for a quick demonstration. The DuraShield manhole security device is an extreme duty, all stainless steel security device that will secure your communication vaults, fiber optic cables, distribution valves, grease traps, sewer system, storm drains, electrical lines, steam lines, water lines or virtually any other type of cable, pipe, wire or underground infrastructure accessed through a manhole. Easily handled with one hand, the DuraShield manhole security device is light enough for any person to carry and install. Security for your manhole opening has never been so easy and convenient. The DuraShield manhole security device is available with or without slots to provide draining and venting if desired. 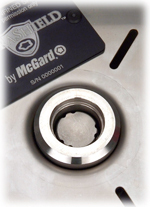 Only the use of McGard’s registered T-Key will allow you to unlock and then remove the DuraShield manhole security device. This same T-Key can be used with other McGard manhole security products. You can now be confident that your corporate campus, military base, university, prison or any through hole that needs to be secured will have a high security barrier to prevent illegal access. There is no other locking pan, insert or device on the market with this type of security system. We can make almost any size DuraShield manhole security device needed for almost any system. Secure your manhole cover to its frame with McGard ManLock high security lock bolts to keep out intruders. Simple yet effective manhole security by way of a patterned bolt head helps to prevent unwanted access to any manhole cover, drainage grate, steel access panel or hinged vault door. Replace your existing manhole cover bolts or modify your ring and cover to accept our bolt. Terrorists don’t have a chance once you install these ultra high security locks. 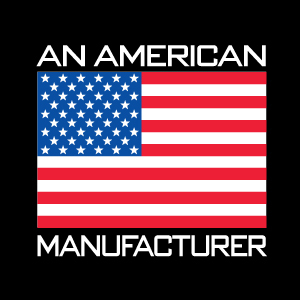 The Intimidator ManLocks are used to satisfy the security requirements of the Federal Aviation Administration (FAA), the Federal Bureau of Prisons (FBOP) and many other military and government agency physical security requirements.